Duh. Graceland is often the first thing non-Memphians associate with this area but the holiday display isn't just for visitors. I highly suggest that everyone go to Graceland during the holidays. Especially you Memphians who have lived here forever and have never gone. They decorate the mansion with the vintage decorations Elvis himself decorated with while he lived here. Fun fact, if you visit Graceland regularly there will be blue drapes in the living room. At Christmas, they're swapped out for amazing red drapes, exactly how Elvis did it. The holiday decorations will be up until January 8th which is Elvis' birthday! Jeremy and I participated in this event a few years ago and ever since I have been recommending it to everyone. Participants put on their tackiest Christmas sweaters and run (or walk) through Shelby Farms. There are Christmas decorations, music, hot chocolate stations, and the best people watching throughout the course. This year, the race is Sunday, December 21st. The Memphis Zoo is a pretty amazing place... especially at Christmas time! This is definitely a holiday event that I always make a point of attending. You mosey around the zoo at night where they have many different Christmas light displays. This is also a great time to see those nocturnal animals that are sleeping during the day time hours! Zoo Lights goes until December 30th. I realize the ballet might not be for everyone, but how can you resist the Dance of the Sugar Plum Fairy around Christmas! Don't miss Nutcracker while it's at the Orpheum performed by Ballet Memphis. There are four shows the weekend of December 13th. Admire amazing light displays from the warmth of your car at Starry Nights where more than 1.5 million lights decorate the largest drive-through holiday light show in the Memphis area. This year, there are 14 new light displays that celebrate some of the most iconic places in Memphis! Okay, I might be a little bit biased when it comes to the Peabody after our perfect wedding this Spring, but the Peabody is so much more than a hotel. Their holiday lights and gingerbread village (yes, village, not just house!) are always must-sees during Christmas-time. The Memphis Botanic Garden has a giant garden just for kids with activities and all sorts of interactive stations for them to use their imaginations. At Christmas, "My Big Backyard" is converted into a winter wonderland. There are themed lights along Playhouse Lane with a musical light show. There's falling snow, giant Snow Globes, crafts, a Giant Light Bright, and so much more! Doesn't that sound magical? Be sure to wear your bedtime best to the Brooks Museum Pajama Party! Admission is free and it's fun for all ages. There will be performances, Elf on the Shelf sightings, a giant dreidel, art-making, and more! I even heard Santa will be there. The party is Sunday, December 14th from 11am - 5:30pm. Support local art by stopping by this holiday pop-up shop! Pick up some Christmas gifts or even a gift for yourself (yes, it's totally allowed!). The market is located ta 1501 Union and will be there until December 24th. One of my absolute favorite Christmas movies is It's a Wonderful Life. On Sunday, December 21st, the Majestic Grill is having a special screening of this classic along with dinner! Their regular dinner menu will be available as well as a special menu. Overton Square is getting decked out in holiday decorations and lights. Don't miss the official lighting on Thursday, December 4th. There will be lots of caroling and music as well as all your favorite Overton Square businesses! Memphis loves their holiday parades! Throughout December, there are several parades in the area and they all are sure to be a fun time. Just be sure to bundle! Oooh! Now I really want to make a weekend trip to your zoo! My husband and I always have to visit the zoo of every city we vacation in. It's our little tradition. I love this list! So many great holiday things to do in Memphis! Don't forget the Enchanted Forrest at the Pink Palace too! We used to do that every year (they have a great Santa at the end). I miss zoo lights--it was one of my favorite Christmas things when I lived there! 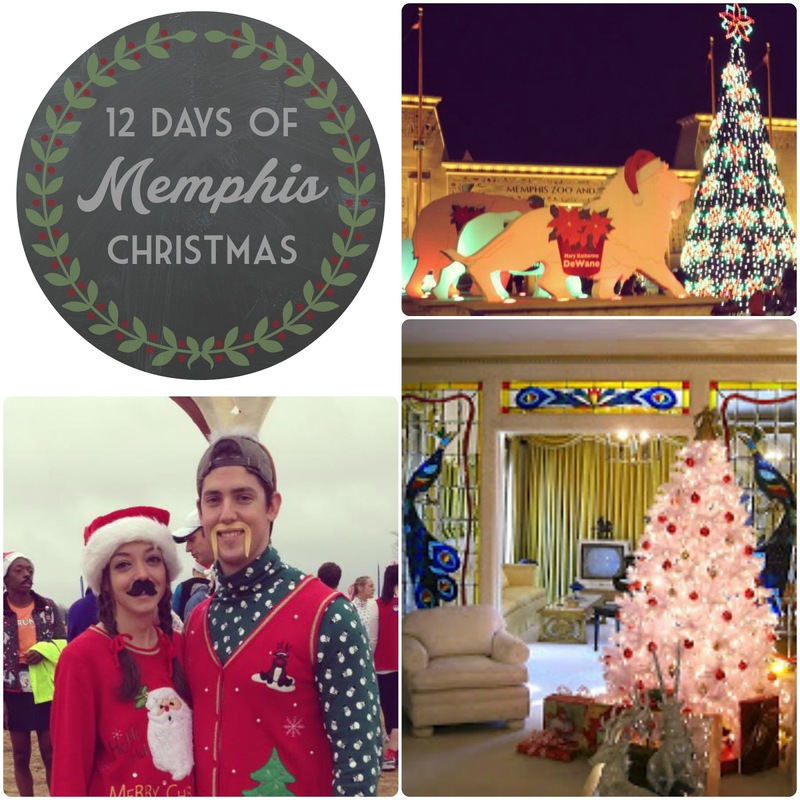 Loved this run down of Christmas events in Memphis! I am really hoping to go to the Zoo on one of the Zoo Lights nights and to go ice skating! Just came across your blog and I love it. Great to see someone blogging from Memphis. I am currently based in Oxford, MS so not too far away!